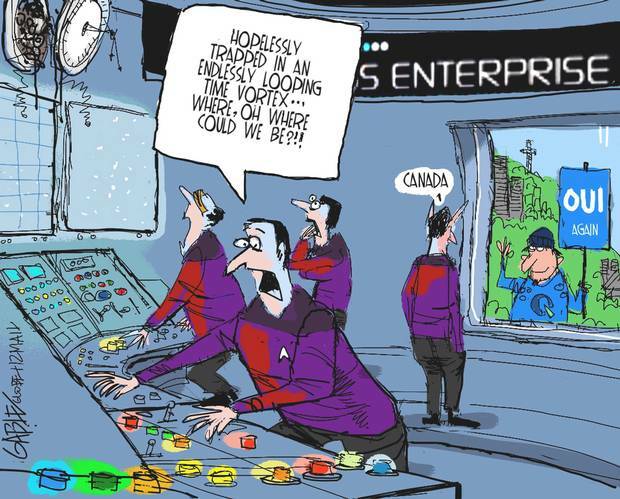 Image: Brian Gable at the Globe and Mail (4 September 2012) via Excellent Future. Everyone is focused on the run-up to the American presidential election. But we might want to cast our eyes northward to the Quebec provincial election in Canada tonight, where Parti Québécois separatists appear poised to form a government. If the PQ wins and calls a referendum to separate from Canada, and that poll is successful, the United States will have a new country to deal with, directly above New England. The rest of Canada, America, France and the UK would be acutely affected by such an outcome, not to mention several other countries (Iceland, Greenland, the EU, other states in the Americas etc.). An independent Quebec would alter strategic interests in North America. After the onset of the Quiet Revolution in 1960, this issue dominated Canadian politics from the near-declaration of martial law during the 1970 October Crisis to the second referendum in 1995. In the latter provincial poll, Canada remained united by a whisker (49.42% of Quebec voters voted to leave Canada, 50.58% voted to stay in the country). After this exercise, it seemed separatism - a 45-year-old-movement - was a thing of the past, a cause of Quebec's 60s' generation. It looks like Quebec's Gen Y has now taken up the banner, based partly on long-running student protests against tuition hikes, and bolstered by broader disenchantment with the province's federalist Liberal party - which intensified during the recession.